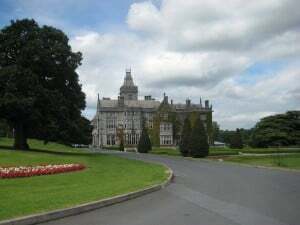 Adare Manor ideal stop off on a luxury Ireland tour. An increasingly popular point to stop during a luxury Ireland tours is Adare Manor, a ‘Travelers’ Choice’® for 2015, according to TripAdvisor. Situated on the banks of the River Maigue in County Limerick, the location of Adare Manor means that it is ideally positioned for a stop-off on a number of luxury Ireland tours. The current manor dates back to 1832, but a grand house has stood on the site long before that. Evoking a true sense of Irish history, Adare Manor is now a luxury hotel and golf resort which attracts visitors from all over Europe and North America. Indeed, Ireland Golf Digest recently also voted it as their number one choice for a parkland golf course in the whole country. Choosing an organised tour which takes in Adare Manor is simple enough with Specialised Travel Services and, given that it operates as a luxury hotel as well as a golf course, booking to stay overnight is not an issue. However, if you prefer to customize your own schedule and, for example, only want stop by to play a few holes or to walk around the grounds, then your bespoke itinerary can accommodate this, too. Whether you prefer to stay at this fabulous property or not, our superbly-organised guided tours of Ireland will work well with everything else you want to see and do in the area. Of course, Adare Manor is popular amongst golfers, but there are plenty of other things to tempt visitors on luxury Ireland tours. For example, the historic Lavender Cottage which sits on the estate has been fully restored and now serves as a therapy centre and spa. Perfect for a quiet escape, the Manor also has a number of high-quality restaurants which serve creations from award-winning chefs. There is even a swimming pool and fitness room sympathetically set into the historic surroundings, so there is always a reason to come. Adare Manor can be booked as part of our Castle and Manor Private tour or contact us to include Adare Manor into any customized tour. Interested in Adare Manor ideal stop off on a luxury Ireland tour. ?